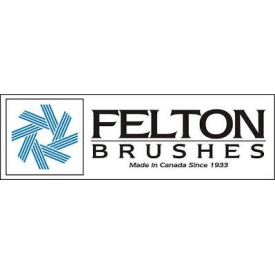 Felton Brushes Limited has been around since 1933, serving the needs of Canadian industry throughout this time. We are 100% Canadian owned, and have recently invested heavily in new World Class brush making machinery. We now run the most advanced brush making platforms in the world, including Wohler and Borghi machines. After travelling the world, including trips to Asia, Europe and the United States, our research brought us to the conclusion that the best place to make quality brushes was right here in North America, exclusively with American and Canadian drawn wire. We have several new patent-pending designs that have our brushes out-performing even the largest and strongest competitors in the business. For our customers this means you will receive the best brushes in the industry, at fair prices.